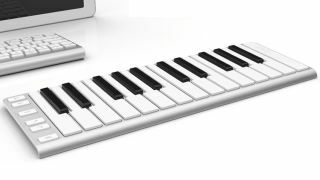 CME XKey: not your average 25-note MIDI controller. NAMM 2013: CME has unveiled a new slimline MISI controller keyboard with a difference. The 25 keys don't have much travel, but they are velocity sensitive and also offer polyphonic aftertouch. This means that the XKey might have considerable expressive potential, and it also has the benefit of being class-compliant with not only Mac and PC but also iOS and Android devices. Check out the specs below or on the CME website. We'll have more on the XKey as we get it - we hear that the price is set to be around $100. 3.6 mm slim edge, elegant aluminium frame, light and portable. USB MIDI compliant with iPad, Android tablet/phone, Microsoft Surface Pro, Mac and PCs. Firmware updatable via USB, ready for new features.